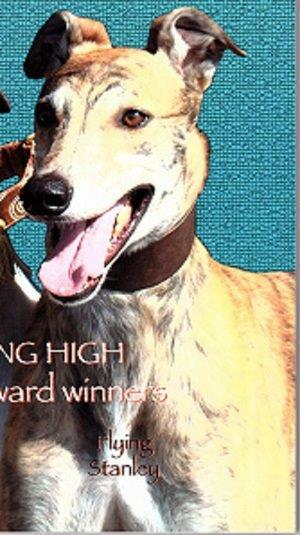 Flying Stanley became the world’s top earning greyhound of his time when he won the Derby Lane Million and garnered $500,000. He earned over $680,000 while racing. Among his other victories were the $75,000 Hollywood World Classic, the $50,000 Wichita Shootout, and the $50,000 Derby Lane Fall Sprint. The red brindle won eight of 16 stake events in which he raced in the finals. Owned by Vince Berland, Flying Stanley was the son of Flying Rimes and 2011 Hall of Fame inductee Kiowa Sweet Trey. He won 34 Races in stakes competition at five different racetracks – Wichita Greyhound Park, Derby Lane, Hollywood Greyhound Park, Palm Beach Kennel Club and The Woodlands. In stakes finals, his record was 8-1-2-1 in 16 starts and his career record was 57-8-7-4 in 86 starts. He held the 5/16-mile track record at 29.48 at the Woodlands. In 2007, Flying Stanley won the rural Rube Award as the nation’s top sprinter and was captain of that years’ All-America team. Among the over 1,000 racers on three continents Stanley produced was Glen Gallon, a superstar in Australia that won over $500,000 on the track.